Growing up on a tobacco farm did not leave a lot of time for vacations and such. Still, my father noticed my desire for doing things outdoors (other than in the fields) and sometime around my 15th birthday he took me and my younger brother trout fishing in the mountains of North Carolina. This would become a regular trip that continued long after I graduated High School. Now you should know my brother and I are quite different as I guess many brothers are. Other than the 4 years age difference, we have huge differences in personality. I usually played the role of peacekeeper while my brother leaned towards being an antagonist. This was especially true when it came to dealing with my father. Now, my father had somewhat of a short temper and I always did my best to avoid putting myself on the wrong side of his mood. I did not always succeed. My brother on the other hand had a gift for pushing the right buttons. I should also make you aware that we did not have a lot of frills growing up. My dad was the no-nonsense sort. While we were never without the necessities, you can rest assured when it came to clothes and such we had we needed, but not much more. Usually new clothing came just before the start of a new school year and we were expected to make them last. This particular trip occurred not long after the school year began. We arrived at the trout stream, set up our tents and me and my brother began scouting the stream in anticipation of the season opener the following morning. At some point my brother found it necessary to wade out into the stream, in the clothes he just happened to have on which included a new pair of sneakers. We walked back into camp and almost immediately my father saw his shoes. Soaking wet, covered in mud, algae and crud. With the reliability of a tax collector dad lost his temper. His face turned red, he swore, threw his cap on the ground and proceeded to verbally tear a new orifice into my brother’s backside. At some point in the tirade he instructed my brother to remove the shoes, sit down in one of the camp chairs and to not “dare open his mouth”! This in no way meant that he was finished, it was just a part of the cycle. My father then proceeded to take the shoes down to the stream where he washed the grime from the shoes by hand. Ten minutes or so later he returned to camp with the cleaner shoes, short of bleach they would never be as clean as they were when we arrived. 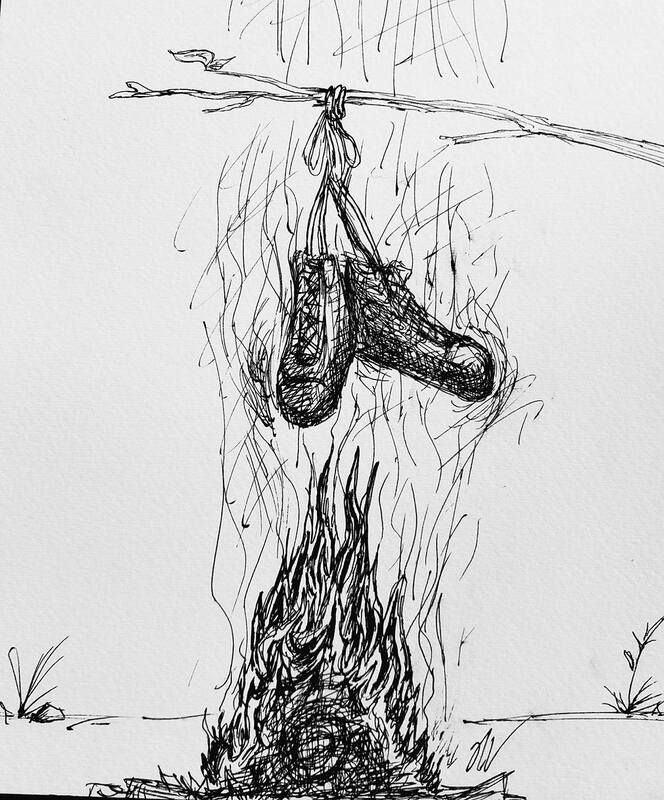 He then stretched a rope over the campfire, tied the two shoes together by the laces and then draped the shoes over the fire. While the berating is slowing down, it continues still and I hear more questions from my father. These type questions continue as my father begins cooking our dinner over a gas stove. His back is turned to myself, my brother and to the campfire. I had nervously spent the last 15-20 minutes watching all of this transpire. At this point I am just happy my father has not asked me why I did not intervened and perform my “older brother” duties to keep my brother out of trouble. Assuming the battle is over I divert my attention to getting my gear ready for the next day. My brother is still seated in his camp chair, staring into the flames of the campfire and doing as he was instructed. As I glance over at him I can see that defiant smirk on his face, his arms folded, now brooding over how his trip has started. The smell of fried chicken wafting through the air is suddenly over-shadowed by my father’s booming voice exclaiming. I immediately look up to see what has happened and at first I can’t figure it out. Then I notice that there is a black smoke billowing from the campfire. Shortly after I realize the shoes are missing. My brother saw them begin to smoke, he watched as the laces gave in to the heat from the fire and as they fell into the coals and erupted into flames. My father is obviously beside himself and turns towards my brother with flames of his own about to leap from his eye sockets. He asks the obvious question one might expect. I cringe and look for an escape route as I hear the reply I already know is about the leave my brother’s mouth. Pretty much everything that happened after that I have buried deep down inside and reserved the telling for if I ever find myself lying on a couch talking to a psychiatrist.